I have been writing several pages on my website discussing some Intuitive Readings and Energy Healing I am going to offer remotely. Since we still are somewhat 'in the dark' about our possible relocation plans, I've decided to use the tools I have at my disposal, and journal the various readings, signs from Nature, and dreams that I have to see ~ as if on a true adventure ~ what unfolds. Considering how quickly the end of August seems to be approaching, you would think we would have a more solid plan! Yet, we do not. So ~ the popcorn trail continues. I happened to pull several cards prior to our 'Magical Blue Moon' road trip, but put them aside to read later as we were heading out to our clinic that day. I got the gist of the message, but actually sort of forgot about it. Thankfully, they were still set aside. I returned to them after our road trip, and was surprised to recall that there were two cats in that spread! Bast, an Egyptian Cat Goddess, and the Black Panther. This on the heals of Don 'randomly' having me read about connecting with the moon, and cats being exceptional guides for doing anything during the dark because of their keen night vision. Then there was the cat love from Rocky on the way home that day. 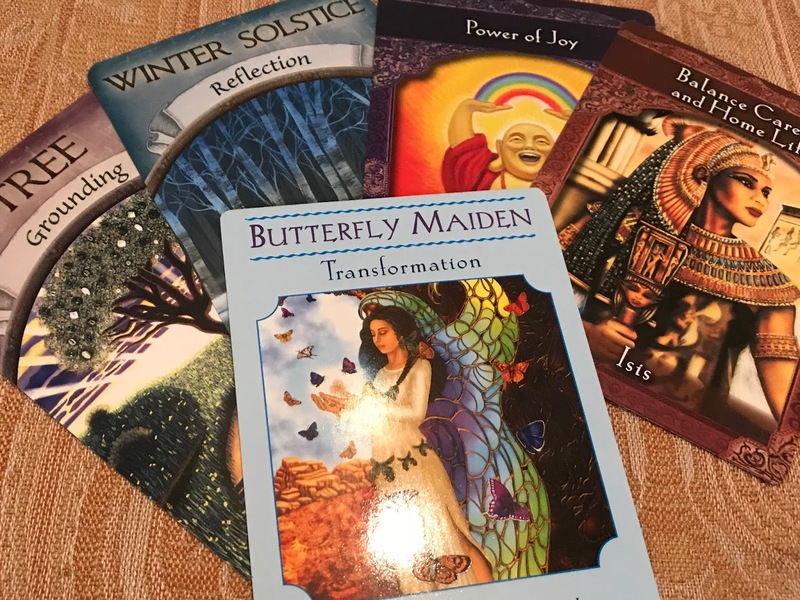 I explain the significance of these cards in my article on Personal Medicine Readings you can read about here if interested. I've been doing an Intuitive Oracle Reading for myself every so often since the beginning of the year, and enjoy seeing the patterns emerge, especially receiving so many parallel messages from different oracle decks. I pulled cards from my 'Wisdom' decks the morning of April 18. 2018. I feel a strong reverence for these decks. To me they have a subtle but palpable power. They seem to emit an energy that indicates not to take them lightly, despite the apparent mythological or mystical appearance. For those who can feel or trust in their presence, there is much they have to offer of guidance and unseen support we can call upon. I intended to pull three from each. I was strongly drawn to two from each deck. I was only lukewarm about two other cards from each, so I pulled them aside, but went with the four total that I was feeling a strong pull for. Coincidentally, the last few times I have drawn cards, the first card drawn has the number 24. All the numbers of this latest spread add up to 125. Adding each of these numbers (1+2+5) equals 8. My birthday numbers when added up to the single digit is also 8. According to The Life You Were Born To Live, A Guide to Finding Your Life Purpose, by Dan Millman, which uses numerology to help us understand our various life lessons, and life purpose, the number '8' signifies Power and Abundance. My actual birthday adds up to 26. Each digit, 2+6 have certain associated lessons that I must go through in order to fully realize the full potential represented by the number 8. If your numbers added up to 53, you would have a similar purpose (power and abundance) but would have the lessons associated with the numbers '5' and '3' instead of the '2' and '6'. He explains the various life lessons associated with the different numbers, along with suggestions for how to work through the lessons. For those who may not know, Dan Millman is the author of several books, including The Way of the Peaceful Warrior, one of my favorite books published in the early 1980s. It has since been made into a movie, Peaceful Warrior, with Nick Nolte playing Socrates, the mentor of Millman while going through college at UC Berkeley during the 1960s. He was on the gymnastic team, heading for the Olympics until he had an accident that caused his leg to shatter. I met Millman when he was speaking in Aspen, Co many years back. His Peaceful Warrior series of books had a profound influence on me at that time in my twenties when I first stumbled upon his books. I have read many of his books since, and highly recommend them all so much, I've linked to them here. A super, hard to put down thriller type book is the prequel, Journeys of Socrates. The card I pulled that was numbered 24 is 'Dragon.' The very first card pulled. It represents 'power' and 'strength'. According to the explanation of Dragon, "The dragon comes to offer you its power and strength, to protect and fortify you on this leg of your journey. The Dragon symbolizes true power and reminds you that this infinite source is not found within your personality or ego. True power resides deep within your soul." Continuing, "Remember that the power of the spiritual world can never be broken, and true strength is found within––not in the outside world." After a lifetime of struggle, disappointments, seeming wrong turns, and feeling like an outsider, along with many years spent healing and transforming myself from the inside out, could this be a message that I am finally reclaiming my full and rightful power and internal source of strength ~ something I have been asking to reclaim? Maybe I am finally coming into the full expression of my own life purpose, which according to Millman is Power & Abundance, associated with my birth numbers, which happen to be the exact same numbers as his own! Perhaps the way I handled myself all along the way proved my merit and willingness to 'slay my own dragons' as I unbeknownst to me earlier on had been on the hero's journey all along. The Mystery Card, #52 - This card refers to the "sacred place where all things are created but not yet formed." It is the place of the 'unknowable.' "It points the way to pure power and potential, which meets the magic of intention. It tells you that the magical unknowable forces of destiny and fate are working in your life. The forces that you can never fully understand or control are, indeed, weaving their magic around you to help you fulfill your true purpose." The Winged Wise Ones #34 - signifying angelic help, miraculous aid. Sounds good to me! According to the author, "The Winged Wise Ones represent the aid of all the angels. When you enter their realm, know that your sincere prayers will be answered according to the will of the Divine. This also represents Divine intervention and the potential of miracles to heal and transform as if by magic." It is a message to 'have faith'. "The Winged Wise Ones give you a glimpse of the future by offering messages whispered on the wind. These are translated within you as inspired thought, instantly unraveling the past while revealing the present." The Queen of the Light #15 - "The Queen of the Light is a beautiful Ally and comes into your life to herald success in all your ventures. She illuminates the most important steps on your path and reminds you of your own brilliance. You're intelligent and inspired and all your needs will be met. Remember you are an instrument of the Divine shining through you in this world. You're on the correct path for your highest good." "The Queen also brings you insight into how you manifest your reality in the most miraculous ways. She promises that you'll be shown the next right action and celebrates you as you stand brilliant, joyful, and enlightened at this present time. You've worked hard to come this far. You can be proud to stand tall in your conviction that in your heart of hearts, you know the truth of your situation." Despite all that, I feel good about who I am as a human. I believe that all the 'lack of apparent success' and ongoing physical symptoms were just indications from Spirit (or my own Higher Self) that there was a lack of alignment that still needed sorting out. I feel ever more in alignment now, something that alluded me while vegan. In retrospect, I would not get to where I am now in terms of how I feel if I were still eating a plant-based diet. Success alluded me (at least in my mind) because I was out of alignment. Once we switched to being more carnivorous again, and my health and vitality began to return, everything else began to click in place. I felt more like myself, in terms of who I always felt I could be. While I have spent years working on website development, only to change the URL three, no FOUR times, and not yet make it an income generating site, and despite all the books I have written, (for which I did have some sales) ~ none of that had the needed oomph because I did not have the needed oomph. My motivation and passion waned while plant-based. These cards also seemed to validate to me to TRUST ~ with capital letters! Another major life lesson has been to right myself upwards from feeling thrown sideways, and TRUST my own True Nature, something I now see I was aligned with all along, but made to feel otherwise. I believe this is true for many of us. We are fed narratives ~ however subconsciously ~ and led astray from all that is organic and natural. We learn to go against our own direct experience. This is happening in insidious ways, and goes totally undetected for most. Most simply do not realize they are possibly living the life they believe they should based on popular narratives that were injected like a virus into the system, and has now become so entrenched, it is the Matrix itself. Step out of the Matrix. Follow the trail of your own Spirit ~ and Nature. It's less glossy, no bling, little flash, and not obvious. But in the end, it will be enduring because it will be a more genuine and authentic alignment ~ to the core of your very being ~ in more ways than you or any of us may ever fully realize. Another recent spread using the Earth, Goddess, & Ascended Masters Decks. What way does your Spirit send you messages? Do you find lots of feathers? Notice formations in the clouds above? Do you have a favorite oracle deck? Please share if you feel inclined! 💙🔥💙I love your selection of decks. Beautiful cards with just the right amount of magic and power. I use The Dragon Tarot by Terry Donaldson & artist Peter Pracownik.